Red Hawk was also rated as one of the best public golf courses by Golf Digest, and Golf Magazine for Women has rated the property as a Top 100 course for women. On our mid-May visit, we arrived early and were able to take advantage of their great practice facilities, which include a grass range with target areas, a huge putting green, and a short game section with a pitching/chipping green and two practice bunkers. We also were able to stay for lunch and enjoyed the quality of food and the service) . We highly recommend this total Red Hawk experience at a facility that is locally and nationally renowned for all it has to offer. This is one great golfing environment! The pro shop at Red Hawk features some really nifty attire and golf accessories, as well as a small selection of clubs. The electric carts here are equipped with ball and club washers. GAM's are also in place on all the tee areas. An overriding characteristic at Red Hawk are the abundant landing areas near the greens that give golfers a chance to recover from off-line approaches. The bunkering here is not overstated, but on some holes - a miss-hit shot may result in a tricky up and down situation from incredibly undulating greenside swales and mounding. The terrain is surprisingly rolling for the area, with frequent elevated tees and greens, plus grass ravines and natural areas. 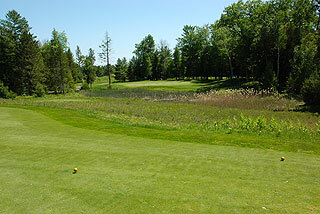 While all the fairways are defined by mature forest, there is generally ample room off the tee, making Red Hawk enjoyable for all levels of golfers. The back tees measure just 6589 yards, but will challenge scratch golfers with a 130 slope. Three additional sets measure 6168/128 slope, 5676/123 slope, and 4835/117 slope. The Gold tees (6168) are fun to play, and are what we recommend for the average player, as they will allow golfers to experience the elevation changes and the beauty of the holes to a maximum. There are only two par fours in excess of 400 yards from these tees. The opening hole doglegs left to a wide fairway with a simple approach - presenting a nice opportunity to get off to a good start. A lay up to within short iron or wedge range along a rolling fairway that slopes to the right is recommended off the tee on number two. The perched green is protected by bunkers on either side. From an extremely elevated tee, the par 3 third is a gorgeous golf hole - and like most of the par threes here, has plenty of room long. Number four bends to the left from another elevated tee, and is best played just right of the fairway trap. The putting surface slopes from back to front so attempt to stay below the hole. 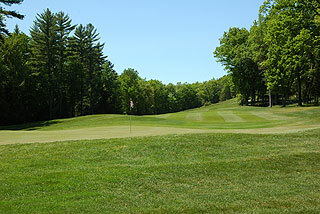 The tee shot on five must maneuver a well bunkered fairway, with the landing area narrowing near the green complex. This is a very pretty golf hole. 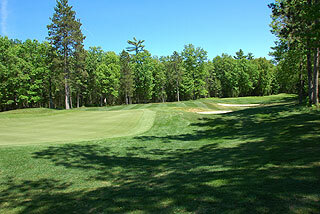 Six is a well bunkered par three with room long and also left past the sand trap. Pay attention to the pin placement as the putting surface is undulating and slopes right to left. The par five seventh begins left uphill then doglegs left downhill to a perched green protected by extreme undulations and collection areas. The tee shot on eight plays up a hill with the left center being the recommended location for a simple approach. The finishing hole on the front presents a generous fairway, bends to the left at the 150, and the raised green is a simple one to approach. 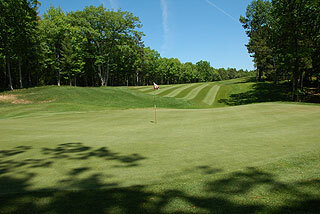 The back side opens with a narrow rolling fairway on ten that slopes right to left. A pond immediately left and trees to the right make this one of the most challenging approach shots of the round. 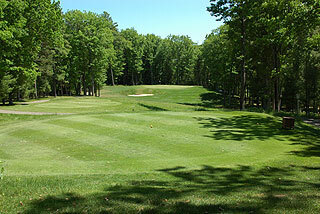 Eleven demands a formidable carry over a lake, to an undulating fairway that doglegs left. We decided to lay up into the water hazard and take a drop, which was pretty manageable. The approach on this hole is also quite tricky, depending on the pin placement. A deep bunker guards the right front of an undulating putting surface. The tee shot on the par three 12th necessitates a carry over a marsh, with room long and also short right. The right center is the place to be on 13, as this hole bends to the right with a slightly uphill second shot. 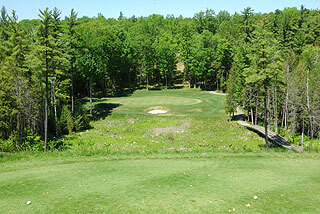 Another shot over a natural area is called for on the par three 14th. 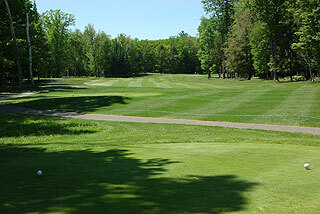 The green complex here is a challenging one, with the narrow double tiered putting surface guarded by a bunker left and mounds that slope downward immediately to the right. The beautiful par five 16th invites a tee shot placed over the right edge of the left fairway trap, which will leave a reasonable second shot over a marsh that crosses about 170 yards out. 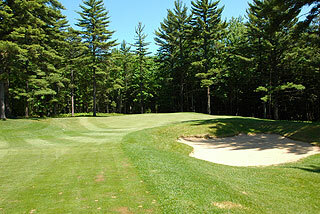 Drives that do not carry this bunker may leave golfers with a decision to lay up to the left - just before the hazard. Either way, the approach to an extremely elevated green complex will require one or 1-1/2 clubs extra. From the tee areas on 17th golfers will discover a grass ravine which must be carried - as anything short will leave a difficult up and down from a severe greenside slope. The finishing hole begins with a wide fairway that narrows as it snakes its way uphill along rolling terrain, with mounds, bunkers and swales along the way. The view of the 18th green is enhanced with the beautiful clubhouse as a backdrop. Red Hawk is a tremendous golf facility. We cannot recommend it highly enough. Accommodations can be booked with the Tawas Bay Beach Resort or the Bay Inn and other hotel properties nearby - and Lakewood Shores Resort is within a 20 minute drive. Click here for our informational page for Red Hawk, with a link to their web site provided.